The fit is spot on according to a good number of wearers. Most buyers highly recommend the LeBron Soldier 9. They claim that these basketball shoes from the Swoosh are nearly perfect. More than a handful are commenting that the Nike Zoom LeBron Soldier 9 is well made. Many Soldier IX owners love the shoe’s eye-catching design. The traction is just beastly, nearly all testers assert. Similar to LeBron James’s 16th sneaker, a lot of players are satisfied with the Nike LeBron Soldier 9’s cushioning. Almost all testers are amazed at the shoe’s support and lockdown; it is just rock solid. The materials are quite soft and do not require any break-in time, several users comment. Like the Hyperdunk X, several reviewers are saying that these basketball shoes are a little challenging to put on. A few testers believe that the mesh upper is not that durable. A handful of players are quick to comment that they can’t feel the Zoom Air units. The Nike Zoom LeBron Soldier 9 is the perfect shoe for battles on the hardwood. Almost all testers are raving about its beastly performance. The shoe’s traction, support, lockdown, and fit are close to perfection. The Nike LeBron Soldier 9's lackluster cushioning may be its weakest aspect; however, it is still able to deliver a comfortable and responsive ride. Overall, these LeBron basketball shoes are a great addition to anyone’s rotation. The LeBron Soldier IX definitely ranks as one of the best performers of 2015. I really enjoyed playing in the LeBron 12, but I’d take these over them any day of the week. This shoe is a beast. It’s undeniable that they beat the main signatures by a bunch. Crafted for King James, these Nike basketball shoes are designed to handle his explosive power and multifaceted game. The LeBron Soldier IX features innovative straps and Nike Flywire for 360-degree lockdown support. A Phylon midsole with Nike Zoom Air units delivers responsive cushioning and dynamic impact protection. Cushion. The Nike Zoom LeBron Soldier IX has a Phylon midsole that delivers a stable, responsive, and comfortable ride. Heel and forefoot Zoom Air units provide low-profile cushioning and enhanced impact protection. Traction. These Nike basketball shoes boast a decoupled rubber outsole with hexagonally-shaped traction pods for increased range of motion and superior multidirectional grip. Length and Width. The Nike LeBron Soldier 9 reportedly fits true to size. Buyers are advised to order their real size. Lockdown. Innovative straps combined with dynamic Flywire secures the foot from every angle. The Phylon midsole also wraps up the heel and lateral side for enhanced lockdown and containment. The LeBron Soldier IX features a breathable mesh upper with fuse overlays for added support and durability. A cushioned internal bootie provides a comfortable fit. LeBron James’s Soldier line is famed for delivering exceptional lockdown. These Nike basketball shoes continue the tradition with its dual strap system that crisscrosses the ankle and midfoot. King James’s logo is seen on the midfoot strap while a large Swoosh is displayed on the lateral wall. Aside from the general release colorways, player exclusives were also given Nike-sponsored colleges and participants of the brand's elite basketball academy. Made in collaboration with Miami-based artist Freegums, this limited edition two-shoe set features a unique graphic that covers the entire upper. The pairs come in either Game Royal/Bright Crimson-White or Black/Concord-White. The ‘Quai 54’ pays tribute to the Jordan Brand-sponsored streetball tournament that takes place in Paris. This limited edition colorway features a black mesh upper with white straps. COmpleting the streetball theme is a cement-like print that runs through the side. 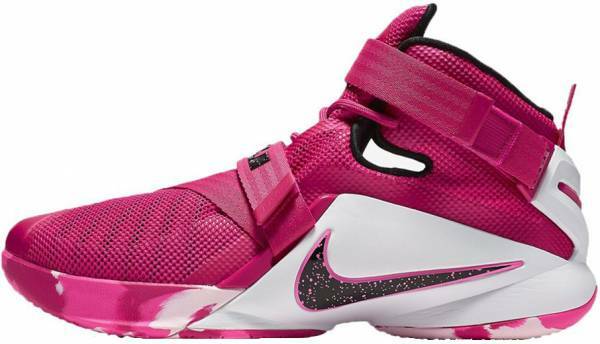 This colorway of the LeBron Soldier IX shows support to the Kay Yow Cancer Foundation. These basketball shoes are dressed in hyper pink with white and black accents.